Image courtesy of Lotus View Camera..
Lotus View Camera is a camera maker in Ostermiething, Austria. 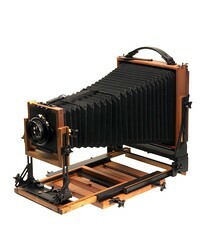 It makes the wooden Lotus Rapid Field view cameras in ten different exposure format variants, from 4x5" up to 20x24". Lotus View Camera was founded by Burkhardt Kiegeland in 1997 as a branch of the "Weisser Lotus Produktions und Vertriebs GmhH", a company situated in the Austrian countryside near Salzburg and which was a project of working and living together of several famlies with their children. 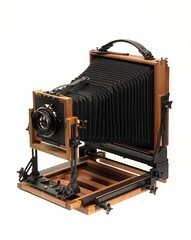 For his art work Burkhardt Kiegeland needed photographic accessoires which he found unable to find in the necessary quality so, together with a carpenter and a metalworker, these were produced by themselves. 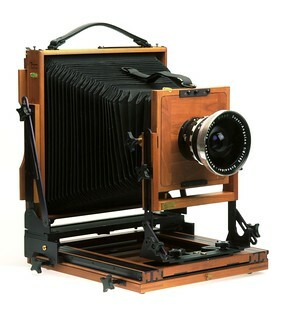 In September 1997 their first camera was sold, a 12x20" view camera. 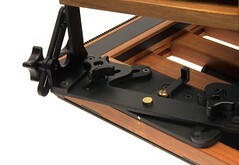 Thanks to, amongst others, the renaissance of the Large Format at that time the sales grew rapidly and in 1998 a collaboration with a partner in the USA was started. In its hayday Lotus View Camera employed about 15 people. Lack of finacial revenue led to a take-over of Lotus View Camera in 2001 by its current owner, Günter Ströbele, whose wife, Maja, was the lead saleswoman at that time. Gradually the focus of Lotus View Camera was shifted to a higher degree in quality of their cameras which could be achieved thanks to feedback from both customers as well as employees. Also the ability to realise custom-build designs proved to be an important factor in the continuing success of the company. 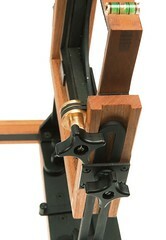 Detail views of the Lotus Rapid Field 5x7inch camera. This page was last edited on 9 April 2013, at 13:31.